Watershed Trust is one of the community groups helping to cut back invasive Phragmites, the pernicious grass that’s spreading along the Georgian Bay shoreline, local wetlands and streams. We received a $15,000 grant from the Weston Foundation towards Fighting the Phrag and passed the money on to the NVCA. Sarah Campbell, aquatic biologist with NVCA, organized the cut, led the volunteers, and provided training and equipment for the cutting. This is the fourth year of community organized cutting the Phrag. 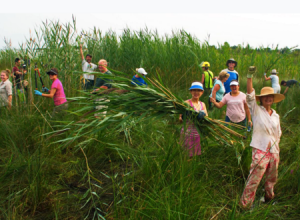 We had a great turnout of 139 volunteers meaning more Phragmites were cut. More than three tonnes of Phragmites were removed on August 18 this summer. Volunteers contributed more than 450 hours cutting and removing the tall, extremely dense grass that is destroying habitat, making swimming and boating more difficult and blocking scenic views of the lake. There were two work parties, one at 8 a.m. and another at 1 p.m. A BBQ lunch was provided for all the volunteers. We are seeing some success. 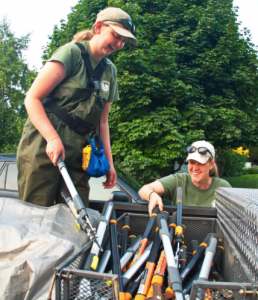 The volunteer cuttings have slowed the spread of Phragmites along the shoreline, particularly helping to protect the rare Great Lakes coastal marshes of Collingwood. Blue Mountain Watershed Trust, the NVCA, Georgian Bay Forever, the Town of Collingwood and local condominium associations have led this effort.